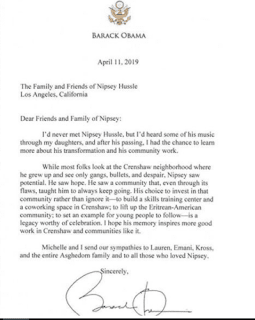 Former United States of America President, Barack Obama has paid his tribute to Ermias Joseph Asghedom, professionally known as Nipsey Hussle who was fatally shot weeks ago. Since the murder of Nipsey Hussle, several celebrities have paid their tributes and one of the latest to do this is Barack Obama. Barack Obama paid a very heart touching tribute in a letter that was read at a memorial held for the late activist on Thursday. The Ex-president stated that he never met the late rapper but he’s heard about his charity works in the Crenshaw community and his music through his daughters. He expressed his gratitude to the rapper for his choice in investing in the community despite the level of violence experienced there. 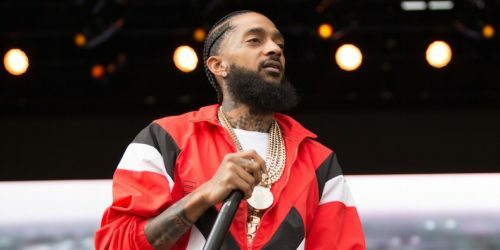 He also calls Nipsey a role model to the younger generation and a legend worth celebrating.